Mr. MacDonald was referred by a friend of his and started his training here at the Manchester Karate Studio in the summer of 1997. He received his 1st Black Belt 4 years later in the summer of 2001. He then became an instructor in 2002. It is was and still is his passion & goal to share the benefits & values he has gained from the Karate program with others. 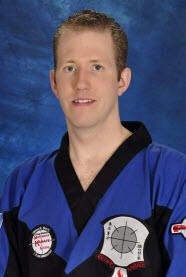 In November of 2003 he was then promoted to his 2nd Black Belt. By this time he had his current position as Full-Time Professional Program Director. Then 3 years later he was again promoted to his 3rd Black Belt in November of 2006. In June of 2007 he was inducted into the World Marital Arts Hall of Fame as "Martial Arts Professional of the Year." He was promoted to his current rank of 4th Black Belt in December of 2010.